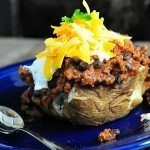 Twice Baked Potatoes Recipe – These potatoes make any meal an event! 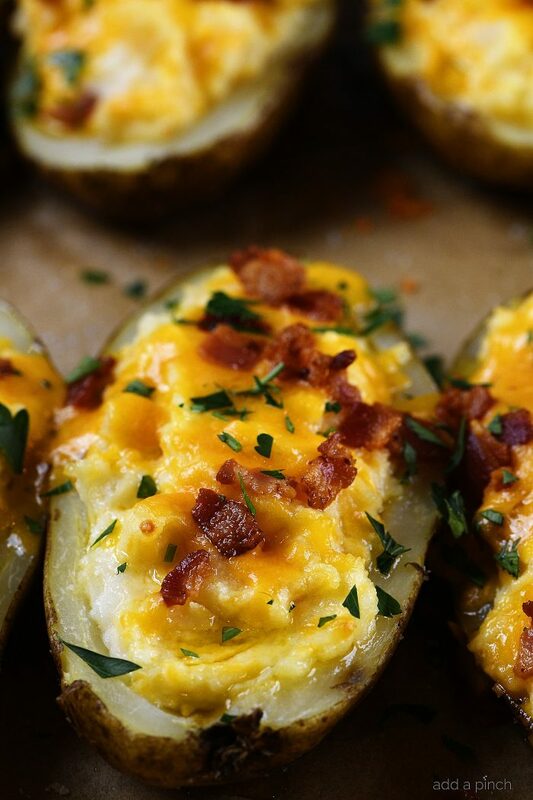 They take baked potatoes to a whole new level of creamy, cheesy, buttery deliciousness. 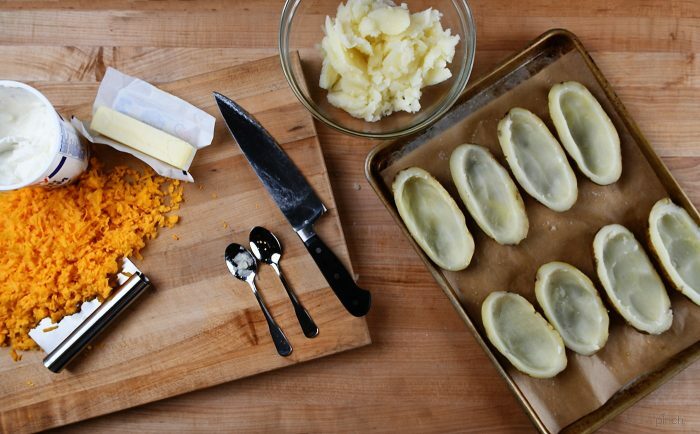 Easy enough to make ahead in stages, twice baked potatoes make an elegant side dish when entertaining! Twice baked potatoes may seem overly complicated and I remember being a little intimidated by them when I was first married. They were always something I would order when I found them on a menu at a restaurant, but friends, once I started making them at home, I never looked back! No matter how simple the other dishes I serve, when I include twice baked potatoes, I always know everyone will remember the meal. I begin by scrubbing my potatoes well and then coating them in olive oil and a sprinkling of salt. I then wrap them tightly with foil and bake them until they are tender, about 45 minutes to 1 hour. Then, I allow the potatoes to cool just slightly and then split them in half lengthwise. Using a metal spoon, scoop out the center of the potato into a mixing bowl, leaving about 1/4 -inch edge around the rim of the potato for structure. 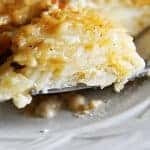 Once I began making potatoes in my Instant Pot, I realized how much I love the texture of the potatoes! 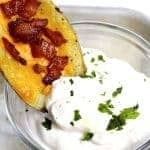 Recently, I’ve been making my Twice Baked Potatoes using a combination of the Instant Pot and the oven and friends, even if you use your Instant Pot for nothing else – use it for this! 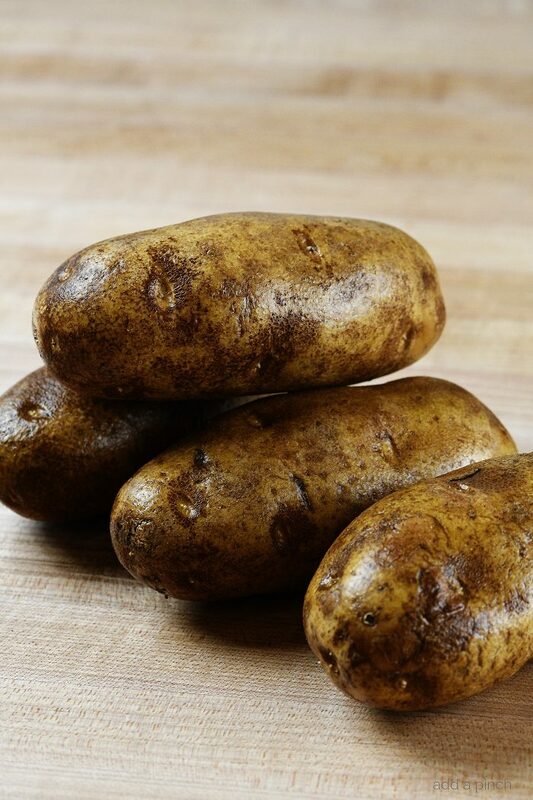 Place your scrubbed potatoes into your Instant Pot along with 1/2 cup of water. Secure the lid of the Instant Pot and close the vent on the top of the lid. Press the steam button on the front of your Instant Pot and set the timer for 10 minutes. Allow the vent to release naturally and then carefully open the lid of the Instant Pot. 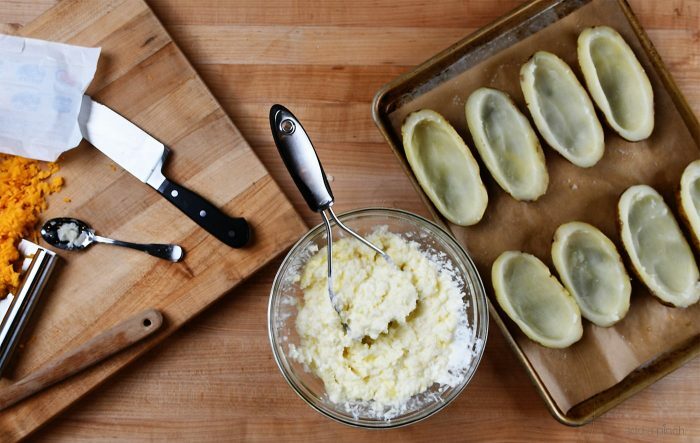 Place the potatoes onto a parchment lined baking sheet. Brush with olive oil and salt and allow them to rest for about 5 minutes to cool enough for handling. Cut the potatoes in half lengthwise and return the halves to the parchment lined baking sheet. 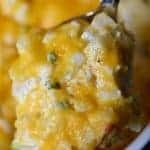 Using a metal spoon, scoop out the inside of the potato into a medium mixing bowl, leaving about 1/4-inch edge around the entire rim of the potato. Once you have your potatoes scooped out into a separate bowl, add your butter and sour cream to the mixing bowl. 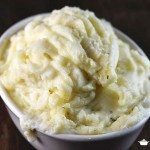 Using a potato masher, mash the potatoes, butter and sour cream together until creamy. Then, stir in half of the cheese. Spoon the filling into the scooped out potatoes and top the potatoes with the remaining cheese. If you are using bacon (yes, please! ), then also top with your cooked bacon crumbles. 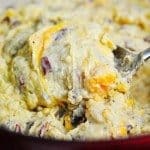 If you would like to make your make your twice baked potatoes ahead of time, at this point, you can simply cover the potatoes with a tight fitting lid to your baking sheet or cover the baking sheet with foil and refrigerate. They should keep well in the refrigerator for up to three days. Then, when ready to bake, simply preheat the oven and remove the lid/ cover from your baking sheet. Bake as directed. Once baked, I love to top with fresh chopped parsley, scallions or green onions, or chives to add a fresh pop of color. 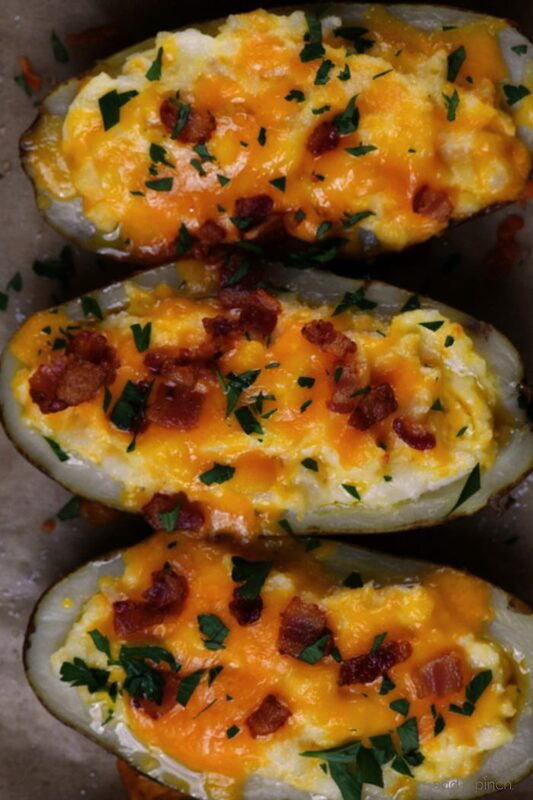 Everyone believes that twice baked potatoes are so complicated and time consuming to make, but I love that they are great to make in stages which allows you to have the hard part completed in advance so you have an even easier day when you are entertaining! 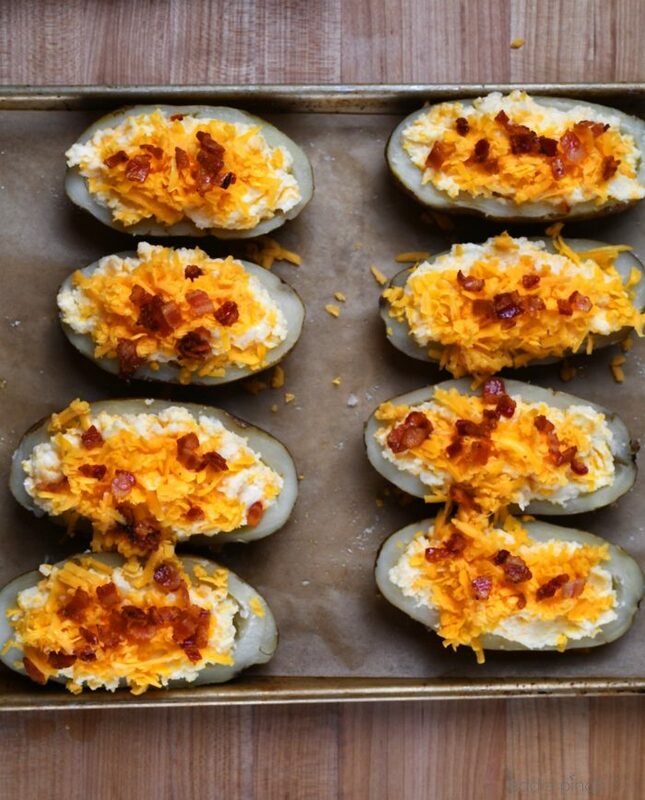 Here’s my Twice Baked Potatoes Recipe. I hope you love them! 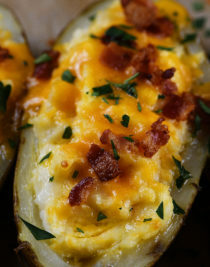 Twice Baked Potatoes Recipe - These potatoes make any meal an event! 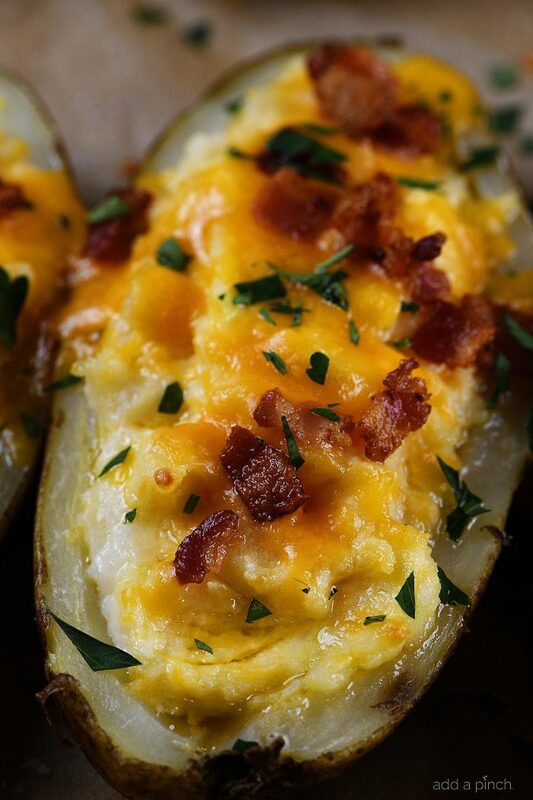 They take baked potatoes to a whole new level of creamy, cheesy, buttery deliciousness. 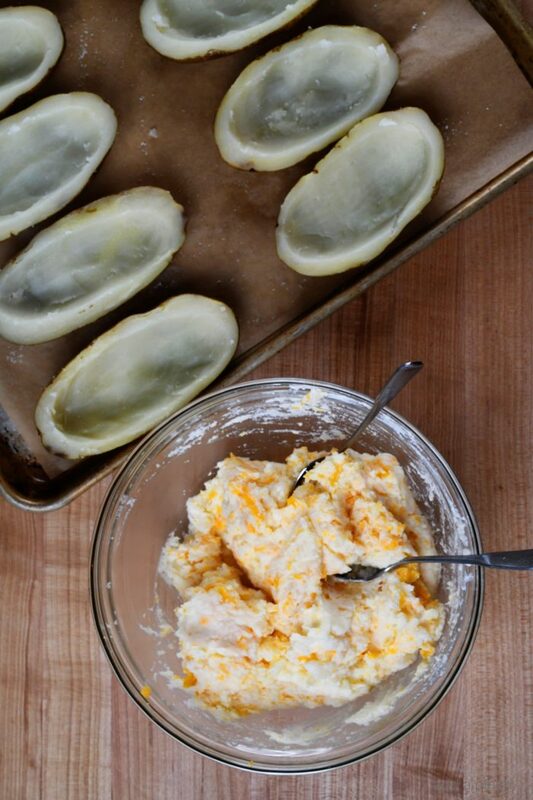 Easy enough to make ahead in stages, twice baked potatoes make an elegant side dish when entertaining! Preheat oven to 400º F. Scrub potatoes under warm water. Place each potato onto a piece of aluminum foil large enough to wrap around the potato and secure at the top and ends. Brush lightly with olive oil and sprinkle with salt. Wrap aluminum foil around the potato and secure. Place wrapped potatoes directly on rack the of oven with a rimmed cooking sheet placed on the rack underneath to catch any drippings that may occur. Bake 45 minutes until tender when you squeeze with an oven mitt. Remove from oven and allow to cool slightly. Unwrap the potatoes, discarding the aluminum foil and cut potatoes in half lengthwise. Scoop inside of potato, leaving 1/4 inch around the edge of the potato to allow the potato to hold shape. Spoon contents back into potato skins or into a piping bag fitted with a large star tip and pipe mixture into the potato skins. Spoon the filling into the scooped out potatoes and top the potatoes with the remaining cheese. If you are using bacon, then also top with your cooked bacon crumbles. Place in oven preheated to 350ºF and cook approximately 15 minutes. Serve warm. Cover the potatoes with a tight fitting lid to your baking sheet or cover the baking sheet with foil and refrigerate. They should keep well in the refrigerator for up to three days. From the Add a Pinch recipe archives. Originally published December 1, 2010. Okay, I really need to make these more often. With that bacon on top, I am sold! I haven’t had these in years. I must make them soon! I haven’t had these in so long – I really need to make them again! Yum! I’ve been meaning to make these for a while – thanks for the recipe and reminder! I love twice-baked potatoes. I still remember the first time I made them for my family when I was growing up. My mom was notorious for overcooked baked potatoes, so the fact that I not only cooked them properly but then added butter, sour cream and cheese to them was a complete turnaround from what the fam was expecting. you have the best food at your house, robyn! yum! Oh yum, Robyn. It has been so long since I’ve had twice baked potatoes! Potatoes are my passion and twice baked ones are just plain amazing!! Yummy darlin’. We love these! I like how you “fancied” them up for special meals wiht the swirling. A simple side that is easy for the busy cook. Cook them about 20 minutes at 350 degrees. Thanks! Can these be made ahead and frozen??? You can make ahead and freeze them. Wrap each one separately in foil and place in an airtight container and freeze. Thaw in refrigerator overnight, then bake about 15 minutes until warmed through. I’d wait to put extra cheese and bacon on top until baking them to warm, but you could freeze with toppings on if you wish. Enjoy! Before I found your recipe, I only made twice baked potatoes for special occasions. 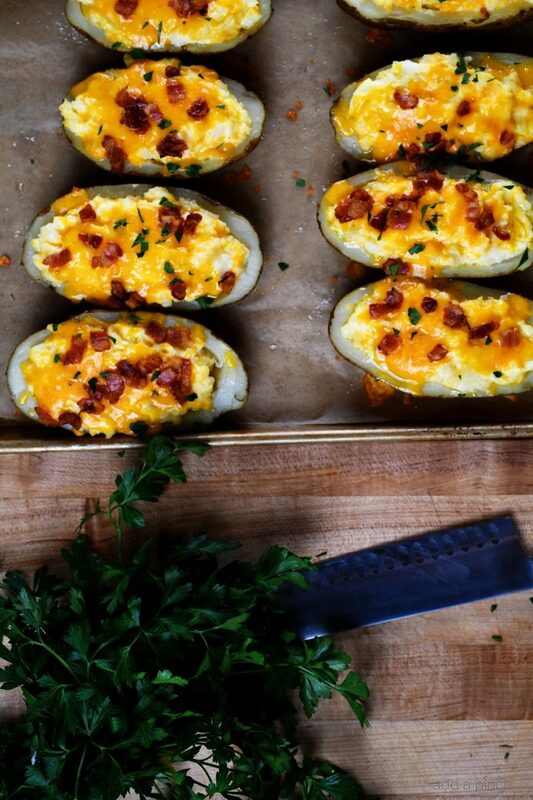 My family loves that I make them now for a weeknight supper and frequently ask for my “new” twice baked potatoes. Thank you!